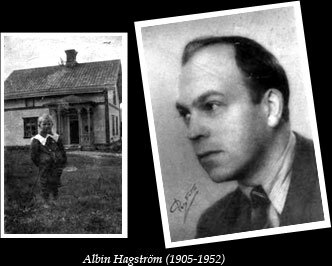 Albin Hagström was born in 1905 in Orsa, Dalarna. At the age of 10 he bought his first accordion and this was to be the beginning of his interest in the instrument which grew in the following years. This interest developed to understanding the construction, production and then marketing the accordion. In 1921 he borrowed 5000 German Marks and bought 2 accordions from Germany. One of the accordions he sold for the equivalent of 175 Swedish Crowns and the other one he leased out to dance halls and society meetings in the district. He further ordered two more accordions which he quickly sold in his home district. In 1923 he imported 25 accordions from the supplier in Germany and sold these quickly by advertisements in the newspapers. On the 19th January 1925 Albin Hagström was registered as a company. The turnover during the first year was 2,700 Swedish Crowns. During the same year Hagström approached an Italian accordion manufacturer to design a model specially for the Swedish market. This proved to be a success and the demand for the instrument escalated. In 1928 the first affiliated company opened up in Oslo, Norway A/S A Hagström. The company became the distribution centre for the Norwegian market. At this time Hagström opened up several retail outlets throughout Sweden. During 1928 the turnover for the company rose to 500,000 Swedish Crowns, compared to 2,700 Swedish Crowns 3 years earlier. 1932 was a memorable year in the history of the company. The accordion factory in Älvdalen was constructed and the first 45 Hagström accordions were made. The model was named “Excellent”. It was in the industrial sector of Albin Hagströms company which faced the biggest obstacles in the beginning. It proved difficult to get hold of the suitable material, know-how and machinery as well as employing the skilled craftsman. But Albin was continuously seeking to improve work efficiency, modernisation, more effective marketing, more striking advertising and cost savings etc. This was his driving spirit never to stand still without the continuous sight of new goals ahead. It was that feeling right from the very beginning which, set the standard and made the advancement of the company possible. An affiliated company A/S A Hagström was established in 1934 in Copenhagen, Denmark as a distribution and manufacturing centre for the Danish market. In 1938 the establishment of O/Y Hagström AB in Helsinki, Finland was founded. It started out as a distribution centre, but soon expanded into a manufacturing unit. In 1939 a branch opened in the USA called Hagstrom Music Company Inc., located at the Time & Life building Rockefeller Center, New York, N.Y. 9 Rockefeller Plaza, also in 1945 opened the factory in Jamestown 306 East 2nd Street, New York. During the 1940´s music shops were established in Stockholm, Gothenburg, Malmö, Växjö, Karlstad and Örebro. The company even opened subsidiary companies in Helsinki, Finland and Copenhagen, Denmark. In 1946 a factory was opened for the manufacture of accordions under the name of Hagstrom LTD, which was located at Avenue C, Darlington, Durham, England. In 1952 the company reached it’s peak as manufacturer of accordions, producing 15,000 that year. As demand increased there was a need to open up more manufacturing facilities in Orsa, Våhmus, Falun, Copenhagen, accoustic guitars were made in Oslo as well as the accordion factory “Accordia” in Solna, Stockholm. During the same year a sad incident hit the Hagström Company with the company´s founder Albin Hagström passing away at the young age of 46. 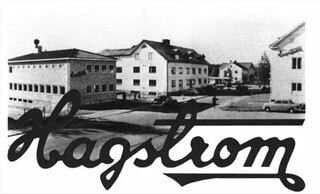 During the 1950´s the Hagström Musik was the largest chain store and expanded with regional offices, branches and shops throughout Scandinavia. Regional offices and shops were to be found in the following towns and cities; Stockholm, Malmö, Gothenburg, Norrköping, Örebro, Sundsvall, Skellefteå, Arvika, Edsbyn, Eskilstuna, Falun, Gällivare, Gävle, Halmstad, Helsingborg, Jönköping, Karlstad, Kristianstad, Landskrona, Ludvika, Luleå, Oskarshamn, Piteå, Skövde, Sollefteå, Umeå, Uppsala, Visby, Örnsköldsvik and Östersund. During this peak period there were over 48 Hagström Musik shops covering the Nordic counties. In the 1950´s came the downward slump in the market for accordions. In Sweden it became harder and harder to sell. In the USA it was almost impossible to sell, as there was no longer a market for accordions. It was now evident that the company was forced to look for new products in the factories to compensate for the increasing decline in demand for accordions. Albin Hagströms son, Karl Erik Hagström took over the export business in 1961. Karl Erik had worked in the USA for a couple of years to gain experience and to give Hagström a strong footing on the American market. It was due to Karl Erik that they received agent support from companies such as Fender, KORG and Pearl, Aulos and Guild just to mention a few. In January 1970 the last accordions were assembled in Älvdalen. There were no fewer than 700,000 accordions made during that 40 year period. Six years after the Second World War Hagström imported and sold Gibson electric guitars and realised an increase in demand for guitars. It was soon taken into consideration if it would be possible for Hagström to manufacture their own guitars. In the middle of the 1950´s Rock ´n´ Roll came to Sweden and by 1958 Hagström had built their first guitar. During the first year of manufacturing they had produced approximately 600-700 guitars. Hagström looked at a Gibson Les Paul 1957, they studied the design and copied the shape of the body. The accordion design even made its marks on the guitars in the beginning, instead of lacquering the work, a celluloid was applied with a decorative imitation in pearloid pattern. In American collectors circles this was named ”mother of pearl” or back home it was called “The glitter guitar”. The celluloid coated neck has its own special story. Instead of a fingerboard made of hard wood (teak, rosewood, jacaranda or ebony) which was common on the Hagström DE-LUX and STANDARD, which was the name of first two models, a fingerboard of plexiglass was made which was designed with contours (scalloped), it was called the SPEED-O-MATIC fingerboard. This was long before Ritchie Blackmore, Mahavishnui and Yngwie Malmsten had it made. Inside the neck there was the world patented ”H-bar”. Other manufacturers put rounded rods in their guitars and bass necks in order to strengthen them. This resulted in altering the shape (in it is self a bad solution) which, did not prevent the necks from twisting. The H-bar also had an advantage in relation to the truss rod, being much stronger in all areas and made the manufacturing of a much thinner neck possible. It became a success due to the materials durability. There was a ten year guarantee given on the neck in many countries, which was cleverly used as a marketing method during the years Hagström guitars were produced. Hagströms first sole agent for the guitars in USA was Hershman Musical Company, which also imported the Swedish Levin guitars. Hershmans had earlier done well with their trade-mark “Goya”. Hagström was an virtually unknown product, Hershmans wanted to sell Haström guitars in the USA and Canada under the Goya name. Hershmans did not want to promote a trademark over which they did not have full control of. Hagströms agreed to this as it was better to sell guitars under another name than not selling any guitars at all. Most of the glitter-guitars were manufactured with Hagström’s own logo under the Hagström name Standard and De Luxe and they are still used today appearing on television. The american group “TLC” used a Goya in their video “Unpretty” in August 1999; Bryan Ferry posed with Hagstrom with one of Roxy Musics’ album covers ”For your Pleasure”; On the Martins latest video ”Yeah Yeah Wow Wow” 1999 (Universal records) shows a glittery Hagström; and the guitars are still associated with advertising such as the 1998 IKEA catalogue. The last of the De Luxe guitars had a double cutaway, two sided head-piece and a ducks-foot which is an extreme rarity today, and seeks a very high price on the market. Hagström De Luxe In 1961 the Hagström electric bass guitars went on the market. It had the same design as electric guitars and were also equipped with a SPEED-O-MATIC fingerboard. The last batch, and they were very few, were the glitter basses which were remade with a double cutaway and a ducks foot head-piece. 1962 saw the beginning of a new model with a slightly new trade name. It was a step away from the Gibson (Les Paul) design. It had simpler Fender head-piece and a body which resembled the Stratocaster. Kent was a low budget model, which had a vinyl-coated backside. The front was covered with a disc of perspex which was lacquered on the inside (this made it durable so as not to tarnish the front of the guitar). The guitar was sold under the name Hagström F-11 in the USA and the equivalent bass was called the Hagström FB. The English distributor (Selmer) did not want to use the Hagström name and so used their own, Futurama (see Hershman). The name to be used elsewhere in Europe was the trade name Kent (a name which Karl Erik got from Japanese musical accessories which were sold under the same name in the USA by Buegeleisen & Jacobson NY. Buegeleisen & Jacobson also sold the Bjarton acoustic guitar under the Espana name in the USA) when the boom in guitars came. The idea with this was that you could sell the guitars to anyone who wanted to have a Hagström, either for their own use, or to be sold in a shop without the infringement of an earlier established distributership who had a stock of Hagström guitars. You could maintain that they were not Hagström guitars which were being sold, they were in fact Kent guitars. This was a marketing method which Karl Erik used with other names, even in the USA, at least until the letters from upset American distributors arrived when they finally realised they had been selling a Hagström guitar in the store only under another name. Five new models came out on the market in 1963. The Automatic, which resembled the Fender Jazzmaster the sister model of the Corvette and the Impala had its own design. The Automatic was put together by combining features from Corvette and Impala by Ben Davis, owner of the Selmer Company. The models of the Corvette and Impala were a clear step away from the other established models’ with the aim of giving Hagström its own identity. Two new basses were also built. These were the top end models, of the Coronado IV and VI, which were the four and six stringed models built around the same type of body as the Impala and Corvette. These basses like the first Hagström guitar models had a SPEED-O-MATIC fingerboard. In the same year a new version of the Kent was made (both bass and guitar). The body was stripped from its vinyl covering and plexi-glass front. The new model was designed with three single coil pickups and a lacquered guitar body. This new model was manufactured for several more years. 1963 was the year in which the guitar boom ´took off´ for Hagström. The previous year of 1962 Hagström exported 762 electric guitars and 669 electric basses. During 1963 exports had shot up to 5,786 electric guitars and 1,863 electric basses, the majority of these were exported under the name Kent. During the next few years anything relating to guitars was sucked up by the American market, which was a reason why the European, as well as the relatively large English market could make big business in the U.S.A. Seven thousand electric guitars were made in 1964. Hagström concentrated on meeting the demand from the American market. Selmer, the English distributor of Futurama (Hagström) had to be content with the ´left overs´. Exports increased thereafter up to 1966 when a peak was reached of 16,660 electric guitars and 5,800 electric basses and time of delivery exceeded one year. When the pop craze swept across Europe in the 1960´s Hagström built approximately 7,000 guitars a year. Of these 90% were exported to the USA, England, France, Mexico, Argentina, Italy, Germany and Eastern Germany. The partnership between the importer Merson began in 1964. Later on renamed Unicord wrote to Hagström to ask if they could get the exclusive distribution rights for the Hagström guitars. Unicord accepted some ideas from guitar players, such as Tony Jerome and later from the luthier Jimmy D´Aquisto. Unicord not only wanted to have a thinner neck, which led to the narrowing of the H-bar by 25%, but also to have a wider fret. This brought about the difficulties in obtaining the right materials in Europe. The problem was eventually solved by import from a manufacturer in Toledo, USA. (The same supplier as Gibson had). Two new models arrived in 1964. These were the Hagström II and Hagström III, which had undergone various changes during the years. They had the same body as the Kent 1 (strataformed) but also with rounded edges. It was mounted with 2 respective 3 single coil pick-ups which were taken from the Impala and Corvette. They also had one more pronounced fender cut head-piece than the simpler Kent model. A new body design was given to the Hagström II and Hagström III in 1965 with pointed horns. This design was a combination of a Strata and a SG. Four new models also came out on the market during this year as well as a re-launched model with a new name. There were 2 new basses and 2 guitars. This included the Hagström 12, which was a twelve stringed, solid body guitar with the design of the Hagström II and III; the Viking which was Hagströms first half acoustic guitar (it was the first time that Karl Erik was prepared to manufacture new styled guitars such as the semi-acoustic); and the Concord, a semi-acoustic bass with the same body as the Viking. They started to manufacture basses with the body of the Hagström II, at first with old rounded horns and then later in the same year with the new body and with cut-aways, which got the name Hagström II B. The Viking and the Concord were the first guitars and basses respectively which had ordinary control settings for both volume and tone. The new guitars which came on the market that year were similar to the Kent (vinyl guitar). It differed in the respect that it had another neck with a fender head-piece and adjustable pick- ups. It was sold under the name Hagström F-11 and Futurama in England. Most of the exports went to the USA, but there were even some guitars sold to more exotic locations such as Kuala Lumpur, Teheran, Bangkok, Buenos Aires and Vera Cruz. See ad (Write for long & slippery catalog The Mothers Invention) from Unicord with Frank Zappa holding a Hagström 12 guitar. Hagström came out with a worlds first in 1967 with the Hagström 8, the eight stringed bass. Rickenbacker had previously shown a similar prototype one year earlier at the NAMM-fair, but Hagström had begun a line production of the bass while Rickenbackers became a custom made bass. Most of the Eight´s were solid bodies, but only a small number of the semi-acoustics were ever built. A prototype from 1969 with a 32” length (the Eight otherwise had a 30” length) was exhibited in Älvdalen, but this model never went into production. Noel Redding from The Jimi Hendrix “Experience” skillfully used a Hagström 8 on Axis Bold As Love. The Blues Project´s Andy Kulberg was another skilled player as was Allman Bros/Sea Levels bass player Lamarr Williams. A twelve stringed Viking guitar was also manufactured during this year. Hagström expanded with a new version of the Viking, this was the Viking II De Luxe with gold plated machine-heads and adjustable bridges. This was also added to the Concord which, consequently became known as the Concord II De Luxe. In Memphis. There is also a video available with Elvis playing the Viking. Unicord and Hagström used Elvis in some of their ads playing the Viking but Elvis’s managers advised Hagström / Unicord to stop this. A new semi-acoustic guitar came to light in 1969 which was designed by and named after the American guitar builder Jimmy D´Aquisto. There were two models built, one version with an f-hole and two pick-ups and the other with an oval soundhole and one pick-up. Jimmy D´Aquisto visited the factory in Älvdalen Sweden twice to supervise the production. In 1970 a new guitar was built, which was similar to the Les Paul was called the Hagstöm Swede. The Swede was a little smaller, rounder and thinner in size to the Les Paul and it had a contour-shaped back that followed the shape of the body and humbucking pick-ups of own design and fashion. There were several guitarists which used the Hagström Swede including Jojje Wadenius, Larry Coryell and Björn Ulveus ABBA. In 1971 the Swede was also available as a bass. Larry Coryell, Ralph Armstrong and Daryl Stuermer visited the Hagström office in Malmö, Sweden May 1977 playing and testing the Swede. The Hagström Jazz bass came out in 1973. After correspondence with Fender the name changed to Scanbass in 1977. At the end of 1975 Hagström began to change from Van Ghent made machine-heads to Schaller. From 1977 to 1978 all Hagström basses and guitars were equipped with Schaller machine-heads with a special butterfly design by Jimmy D´Aquisto. Hagström made a synthesiser guitar in 1976 based on the Swede together with Ampeg who supplied the electronic components. It worked according to the principle that when a string was hit and came into contact with a fret, a signal would be converted in the synthesiser and then transformed into a sound. Another bass synthesiser based on the Swede bass came out in 1977. The interfacing technology was still early in its development and the instruments suffered from an audible delay. They required much more precise playing skills. The least mistake become amplified and revealed any mistake made by the player. This instrument was used by guitarists such as Bob Welch, Fleetwood Mac´s John McVie and Larry Coryell. The Patch guitar was by no means a marketing success, but it proved to be a great P.R. boost for the company. The Hagström Scandi was a new model which first saw the light of day in 1976. It was similar to a Strat guitar with three single coil pickups. The Super Swede came in 1977 and was developed from the Swede and among other extras it had a so called “zerofret”. The tone switch had also disappeared and was replaced by a switch which split the pickups. The body became lighter with a sharper edge. According to Stephen Delft the microphones had also changed somewhat, from a more ”HiFi” sound to a sound which lies nearer to the American ”high-output” humbuckers. Sometime during 1977 or 1978 they began to glue the on-screwed necks on all the Swede guitars for better endurance. A guitar called the Partner was produced in 1979. It was not a new model, more like a revamped version of the Hagström II. The material used to make this guitar was in fact in excess from production of the previous model produced in 1976. The Super Swede bass was the last of the Hagström bass guitars, produced during 1980 and 1981. Despite the name it did not have much in common with the Swede bass. This was a completely new model with a double cutaway and a very thin throughout the neck. It also had an unusually powerful pickup for being a Hagström bass. This was a bass which according to many players was in a comparable class with the top American and Japanese manufactures and among others was used by Rutger Gunnarsson in ABBA. The guitar and bass guitar manufacturing ceased 1983 and during that last quarter of a century 128, 538 electric guitars and electric basses had been manufactured, as well as 7, 500 amplifiers, loud-speakers, mixers and echo machines. Due to strong marketing efforts Hagström succeeded in getting internationally renowned musicians to use Hagström instruments; Jimi Hendrix, Noel Redding, Frank Zappa Larry Coryell, Bill Nelson, Fleetwod Mac, Bryan Ferry and Björn Ulveus ABBA are just a few of the artists who played the Hagström instrument. Today the AB Albin Hagström continues and undertakes selling of guitar and bass parts which were manufactured during the fretted instrument era. There is today, a great demand for spare parts. In 2005 a re-launch of The Hagström Guitars has started. Through a licence agreement the best models are beeing made in U.S.A and China. Who knows ….. may-be some day in the future there will new production of The Hagström Guitars and products in the place where it all started, the small village of Älvdalen in Northern Dalecarlia, where the clever constructors and workers at the Hagström factory once made the tools and inventions that brought the Hagström name to fame. And, all tools are still being kept in good condition! That is in short, the story of AB Albin Hagström translated and compiled, from Magnus Nilsson school essay at the Gothenburg University in year 2000, by Albin Hagström´s grand-son Karl Erik Hagström j:r in 2005 with the help of some friends. Yet there is much more to tell about the work at the factory, storys from the many families in Älvdalen that, one way or another, was involved in the making of a world famous brand, "Hagström musical instruments and amplifiers". ©albinhagstrom.se - All rights reserved.